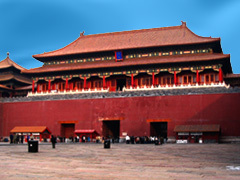 China officially the People's Republic of China (PRC), is a country in East Asia. It is the world's most populous country, with a population of over 1.3 billion. Covering approximately 9.6 million square kilometres, China is the second-largest country in the world by land area after Russia and is either the third- or fourth-largest by total area, after Russia, Canada and, depending on the definition of total area, the United States. China's landscape is vast and diverse, with forest steppes and the Gobi and Taklamakan deserts occupying the arid north and northwest near Mongolia and Central Asia, and subtropical forests prevalent in the wetter south near Southeast Asia. The terrain of western China is rugged and elevated, with the Himalaya, Karakoram, Pamir and Tian Shan mountain ranges separating China from South and Central Asia. The Yangtze and Yellow Rivers, the third- and sixth-longest in the world, have their sources in the Tibetan Plateau and continue to the densely populated eastern seaboard. China's coastline along the Pacific Ocean is 14,500 kilometres (9,000 mi) long and is bounded by the Bohai, Yellow, East and South China Seas.